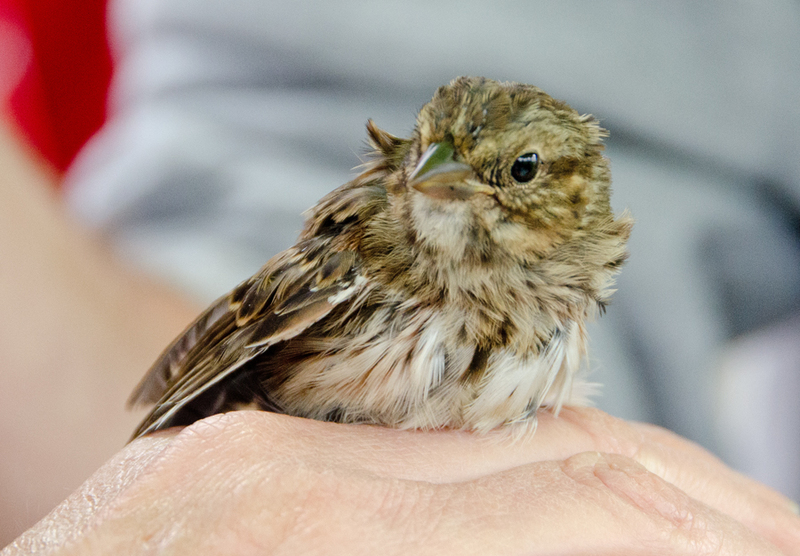 Two years ago a Penn State grad student, Emily Thomas ’07a, ’09, started offering informal sessions to give fellow students some experience in bird banding—a process in which you set up nets to capture birds in the wild, then record data about each one, fit it with a leg band, and release the bird again. Students in the wildlife and fisheries science major, especially, benefit from having that kind of experience on their résumé. Emily had a banding “sub-permit” (sort of a junior license), so she was able to provide that experience to them. I went to a couple of those banding sessions in the fall of 2010 and loved the opportunity to watch the banding process and to photograph birds up-close. I wrote about the experience here and here. The banding sessions have continued every spring and fall—that’s migration season, and thus the best time to capture a variety of species that are moving through the area—and they’re now under the direction of local volunteer Nick Kerlin ’71, who is an experienced naturalist and has an actual bird-banding license. I went to one of Nick’s sessions yesterday and, over the course of four hours, got to see a lot: two downy woodpeckers, a chickadee, several song sparrows, a least flycatcher, a Swainson’s thrush (that’s the bird at the top of the page), a phoebe, a black-throated green warbler, some catbirds, a brown thrasher, a couple of house finches, and more goldfinches than I could count. Here’s a quick overview of how the process works. Nick and the students string up something called “mist nets,” which look a bit like badminton nets, at various locations at the edge of the woods or actually in the woods, and wait for unsuspecting birds to fly into them and get tangled up. Every 30 minutes they do a “net check” and carefully untangle any birds they find. 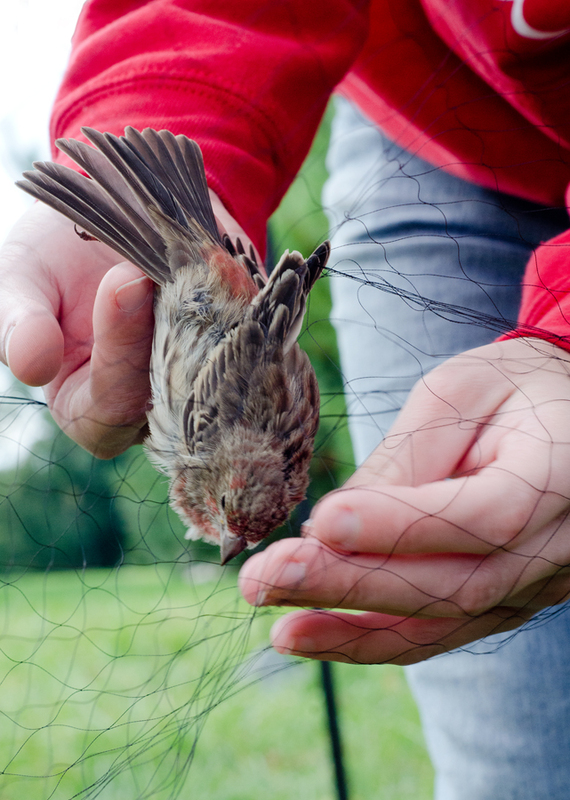 At right is a student removing an upside-down house finch from one of the nets. Then they put the bird into a little cloth bag and bring it back to the “banding station” (basically a card table under a canopy) to be processed. They measure it, weigh it, figure out how old it is and whether it’s a boy or a girl. They fit it with a tiny metal leg band that’s numbered, so that if the bird is captured in some other banding operation elsewhere in the country, they’ll know something about its migration route. Then they hold the bird for anyone who wants to take a photo, and let it fly away. The weighing part is especially interesting because of the technique they use. I had seen this at a bird-banding operation in Alaska five years ago, so it must be universal. 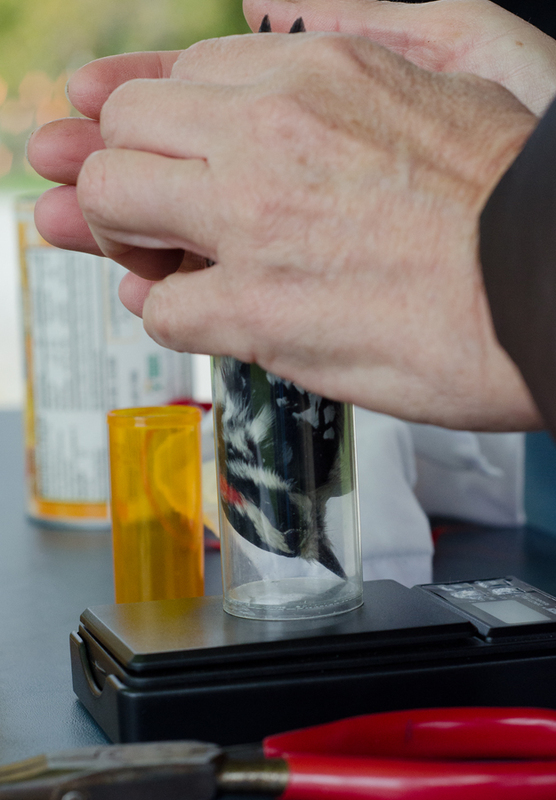 They take the bird and stick it upside-down into a plastic container—it might be an empty prescription bottle, a 35mm film canister, or (in the case of larger birds) an empty orange-juice concentrate can. At right is a downy woodpecker getting weighed yesterday. You’d think the birds would be freaked out by all of this handling, but in reality they’re pretty calm throughout. They do put up a little bit of a fuss at times, and some of them try to bite the person handling them. 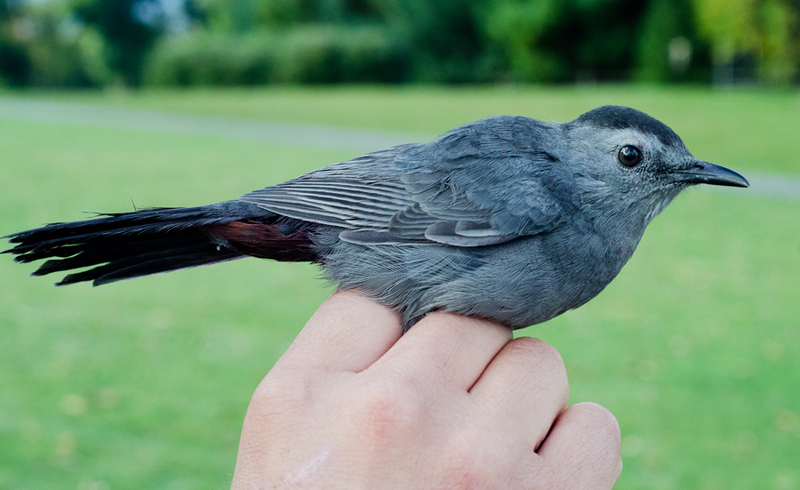 Occasionally a bird does start to look stressed, in which case the volunteers try to get their work done quickly, skip the posing-for-photos part, and get the bird released as soon as possible. 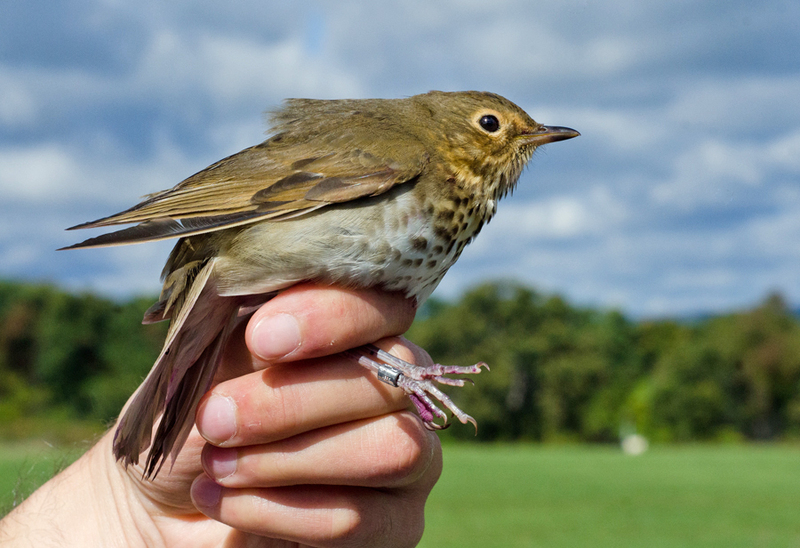 If you’re interested in attending any of the banding sessions at the arboretum this fall, here’s a link to a downloadable PDF of the schedule. The sessions are open to the public. And you can see more photos from yesterday’s session and past sessions at my Flickr page. Entry filed under: University Park. Tags: bird banding, Emily Thomas, Nick Kerlin. Yet another example of enterprising, generous PSU students and alums. Thanks for the article. I just hope the PETA people don’t get their noses out of joint about any of this.